After their victory against Laredo in the South District finals this weekend, the Apaches now advance to the national tournament in Prescott Valley, AZ. Now ranked at No. 4 in the nation, the Apaches are on the road to defend their naitional title. This is the eighth consecutive trip to the national tournament for the Apaches. TJC won the national championship in 2016 and in 2015 they lost in the national championship game. The Apaches defeated Mississippi Gulf Coast Community College 5-2 in the semi-finals of the South District Tournament on Nov. 3-4. Gulf Coast is ranked at No. 20. Their win led them to district finals on Saturday, where they had another victory defeating Laredo College, 2-1, leading them to Nationals. 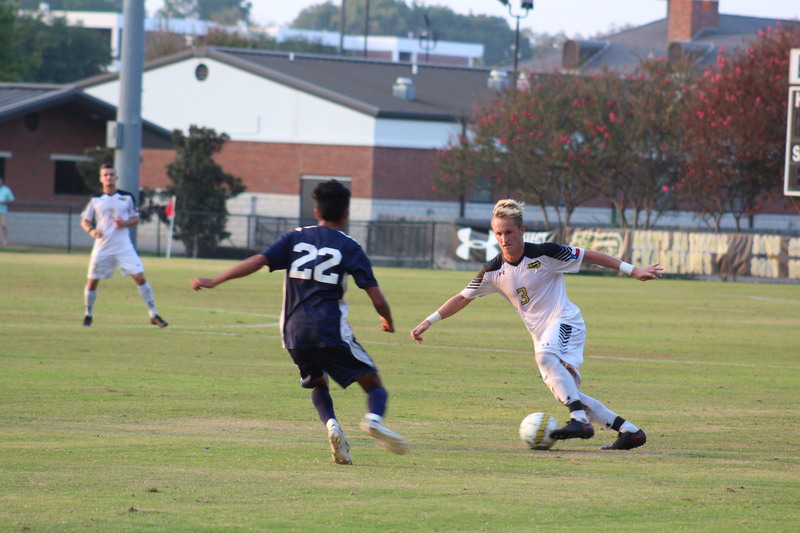 Before the District Semifinals, Coach Steve Clements, head coach of the TJC Men’s Soccer team, stated that he was hopeful that his team would be successful and win the next two games to be able to move on and compete in the National Tournament. “It’s been a good group of guys to work with, they’ve worked hard,” said Clements, “the team has gotten better towards the end which is the right time to do so.” The Apache’s defense ran 9 straight shut outs during the last few games which added to their success this season. Coach Clements made it clear that the success is due to the hard work of all the players but he mentioned it is hard to ignore the fact that Mohammed Kamara has been one of the top players this season. With 42 goals scored this season, Kamara has now beat Dom Dwyer’s record at TJC. Dwyer is a former TJC Apache who now plays for the U.S. Men’s National Team. Dwyer previously held the title for scoring the most goals in one season before Kamara beat that record at District finals this past weekend. “Hopefully they’ll get the job done,” said Coach Clements. The Apaches are seated No. 4 in the tournament and in Pool D with Indian Hills Community College and Louisburg College. TJC will play Louisburg on Nov. 13 at 3:30 p.m. then will face off with Indian Hills on Nov. 15 at 6 p.m. at the National Tournament. The winner of the pool will move on to semifinals on Friday and then finals on Saturday, Nov. 18 for a chance to defend their national title. TJC Men’s soccer team is so good it’s unreal. I hope they win nationals this year that would be crazy!